The Criterion edition of Hard Boiled was the very first dvd I ever bought, it quickly went out of print and shot up in value on the second hand market. 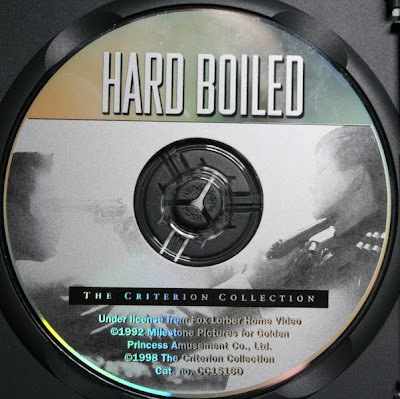 Where money can be made, unfortunately bootleggers will take advantage and with the Criterion versions of The Killer and Hard Boiled some excellent quality fakes have surfaced. Can you tell which is the real deal from the pictures above? The top photo is the real one. I picked up my bootleg version today as part of a lot of dvds purchased from ebay, and I have to say it's very hard to tell the difference between them. If you were choosing between them in a store, from the outside the differences are absolutely minimal. The Criterion collection ribbon across the top of the front cover is slightly taller on the bootleg version compared to the real one. It barely shows up in the photos above but you can just see a difference, that is how hard they are to tell apart. The top one is the real version. Aside from this the only difference I can see is the red and black speckles on the back cover are slightly different, I didn't take a photo of this as I'm not sure it would even show up. Inside the case the disc comes with the same insert that looks like a perfect replica. The real differences are with the dvd itself. If you look at the photos below the top disc is the real one, they look closer than the photos suggest (problems with lighting when taking the picture!) 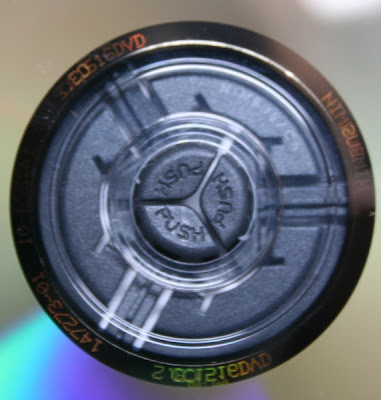 notice how you can see a little more detail in the picture printed on the top disc compared to the bottom one. Again though they are so close as to be very difficult to tell apart, the easiest thing is the inner ring which on the real disc is mirrored (which doesn't show up very well in the photo) whereas the ring is clear on the bootleg version. If you flip the discs around, the information printed onto the ring is quite different. Again the top photo is the real disc. Notice the barcode is missing from the bootleg version. Another difference between them is the paper the cover is printed on is much thinner on the real version, which seems odd really as i would have expected it to be the other way around. Whoever was responsible for the bootleg did an amazing job of it, I guess they made a lot of money from them as the original dvds were apparently selling for up to $300 at one time, so I guess it was worth them putting the effort in! I will be contacting the seller to report this, but to be fair the seller may have been completely oblivious to the fact it was a bootleg he was selling. Does anyone else have this dvd and is it real or have you been ripped off too? 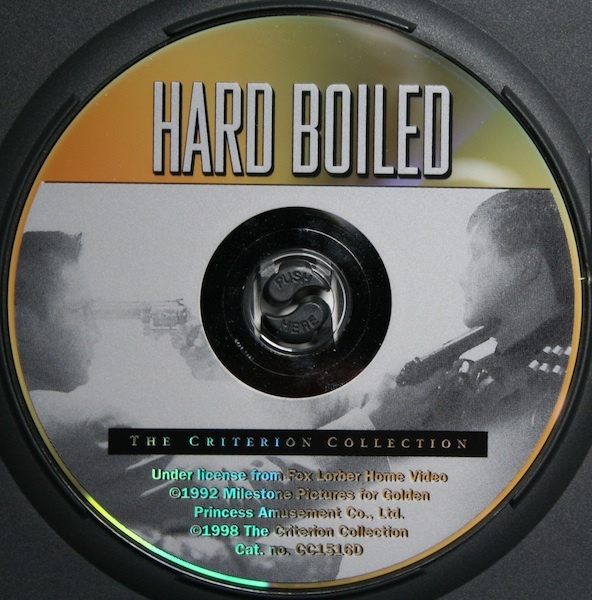 It's unfortunate that Criterion lost the rights to Hard-Boiled right away. People at the criterionforum.org say that the ultimate way to spot the bootlegs is by the barcode part of the inner part of the DVD, as you've shown. Despite the image quality not being the strongest, I'd like to see the Criterion Hard Boiled disc one day, simply due to the Woo short films and the commentary. In the book "John Woo: The Interviews" Woo says he possibly gave Criterion the wrong information about the short films and they might have their names swapped around. I wonder if that is really the case. A, Yeah, the image quality is pretty poor now, although at the time I bought it along with my nice shiny new dvd player I thought it looked amazing! It would be fantastic to have new Criterion editions of all Woo's Hong Kong classics and all new supplements but it seems highly unlikely. 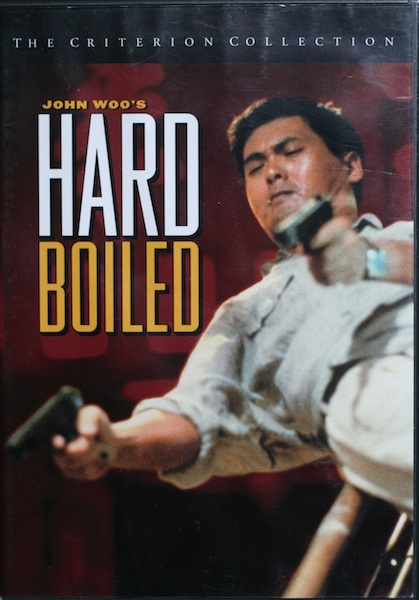 What is the best version of "Hard Boiled" anyway? Anon, If you need an English translation then the UK Tartan special edition is the way to go, it has solid audio and video and the best English translation available. If English isn't an issue then the French dvd is generally regarded as having the best image quality and extras. Welcome to the blog Ken and thank you for your interesting comment. I can't say for certain but I'm convinced this copy was a bootleg, I obtained a refund for it in the end, I was tempted to keep it as a curio but decided I didn't need yet another copy of Hard Boiled. I think it's the lack of barcode on the inner ring that convinces me. Are you sure that your authentic DVD is really authentic? I ask, because I have a couple of DVD's with gold overlapping barcodes and numbers that look just like yours. One is the same brand as yours and looks almost identical. I've never seen any DVD's like this before, and I'm trying to figure out whether they're bootlegs or authentic. Thanks. Alex, I'm completely sure my original dvd is authentic, I bought it almost immediately after it was released, long before any bootlegs surfaced. I just bought one on eBay for just £10. Nobody else bid, possibly because they thought it was a bootleg as it had an '18' sticker on it. I believed it was genuine for exactly the same reason as shops over here are unlikely to sell bootleg DVD's. Turns out it is a genuine Criterion. Has the barcode, Nimbus logo, mirrored ring, etc. Thanks Anonymous. That's a pretty good snag for £10! Criterion had a contract with Amray for the black cases they used for "Hard Boiled" as well as all titles in the early days. 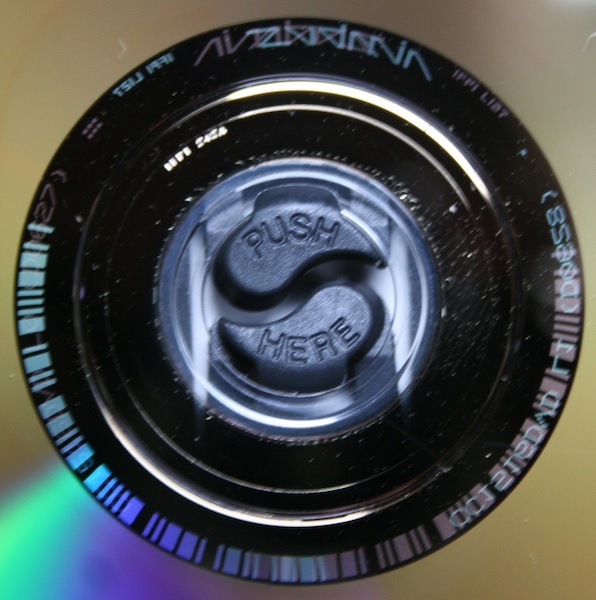 The cases have the yin yang style clasp that holds the DVD and Amray is clearly written on the inside spine in the mold. I did not weigh my case but the weight of the actual case is one of the keys as well as the copies not having the Amray imprint there were several bootlegs If you examine other early Criterion issues they used the same exact cases. If your case does not match the ones of the period you either have a fake or a genuine disc with a replaced case..99% of the time it is a fake but as some were recycled thru rental stores an occasional case got separated from the original discs. The bootleggers never were able to spend that extra $$ on high quality cases which cost quite a bit more than the lighter thinner cases that they used. So the case itself can be a dead giveaway. Also some of the bootlegs have rounded corners on the insert and as stated much heavier paper with a softer printing the dots undervmagnification are not as crisp especially on the Disc printing. They took a photo of the original so the second generation printing is "softer" and not as crisp. I was told at one time there are likely ten times as many bootlegs as originals on the marketplace so chances are not good at finding an original.